AFC Rushden & Diamonds head to Arlesey Town this afternoon (Monday, 3pm) desperately searching for the win that boss Andy Peaks feels will get their season back on track. 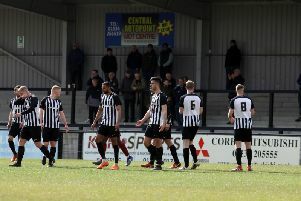 Diamonds stopped the rot at the Dog & Duck on Saturday as they drew 0-0 with Northwood to end a run of four successive defeats in the Evo-Stik Southern League Division One Central. Peaks’ team remain in fifth place – the final play-off position – but have Chalfont St Peter breathing down their necks while Aylesbury also remain in contention. Now Peaks is keen for his team to follow up the point on Saturday with three today. And he is convinced one victory will “change everything”. “If we can pick up a victory at Arlesey then we will put ourselves in a good position,” the Diamonds manager said. “I think one win will change everything for us and this is another chance to get it. “They (Arlesey) have had a bit of an indifferent season but that doesn’t really matter. “I am sure they will be fired up and I am sure they will raise their game for us. “We will have a decent following with us and we have to ensure we take the positive aspects from Saturday and pick up that win that we need. Arlesey sit in 17th place in the table after they claimed a 3-0 victory at Hanwell Town on Saturday.